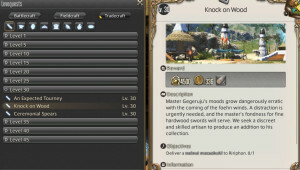 Home » FF14 A Realm Reborn » Carpentry to 50, Got Wood? 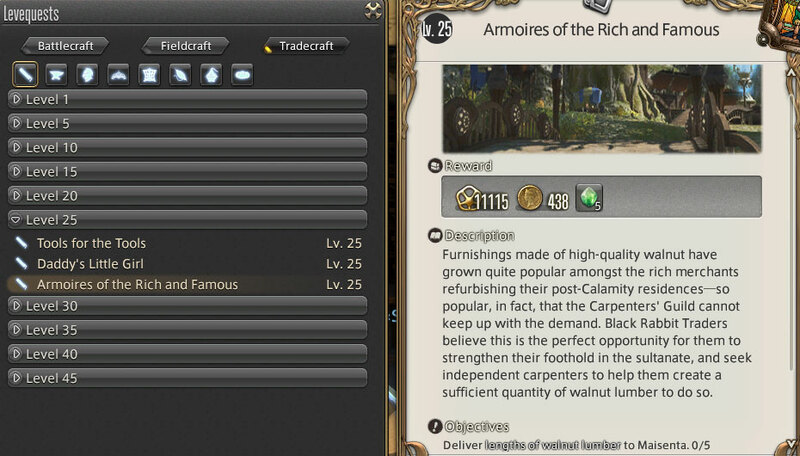 In my journey to max out crafters, I started Carpentry at first to pickup the level 15 skill (Rumination), which is in fact quite awesome for when you’re at the end of a craft and have 100% quality, low CP, and some stacks of Inner Quiet left. All you have then is pop Rumination, and you’ll get about 45~55 CP back, which is enough to pop a Steady Hands and some Synthesis. However, Carpentry has thus far been the most boring to max out, and I started running low on Leves near the last 15 levels, which mean I had to focus on a 3x turn-in one. Now, sure, it netted me 150k total per finishing, but it was really quite boring. The only saving grace was that once I hit 40+ it become really easy to HQ the weapon. 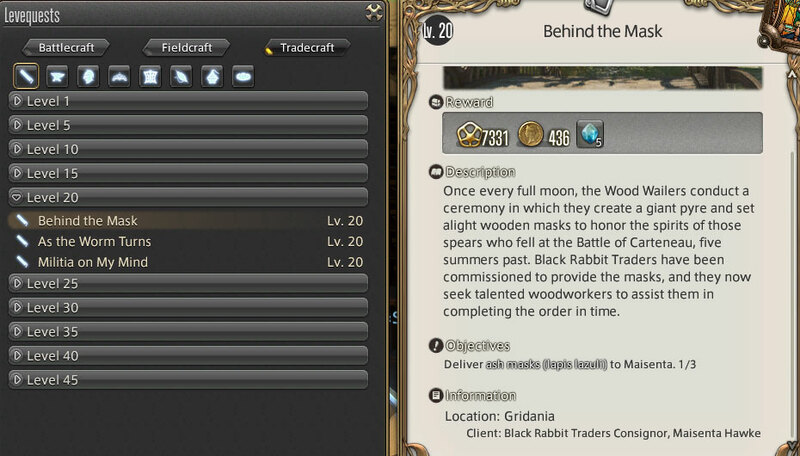 Like the other crafts I’ve maxed out, my goal in searching for leves were to find ones with either easy to HQ items, or items that didn’t have too many items in the recipe. However because I don’t have a Botanist at 40+, I had to buy all the mats I needed to level Carpentry up. This put a damper on my leve abuse, because while there were some that might have reworded more (there’s a 45 leve that with a HQ turn-in rewards 150k exp), the mats were either exceedingly expense, or too difficult to HQ without buying better gear. 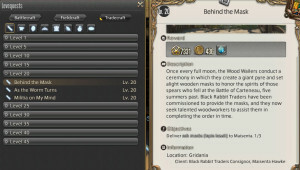 While there are lower level leves, it’s often best to try to power through the first 20+ levels using your crafting log, or trying to HQ some lumber or what-have-you. Because I’m also a 50 GSM, I decided to utilize a level 20 leve for a few levels. 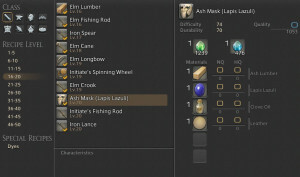 After a few levels of masks, I moved on to making some lumber, Walnut specifically, since the logs were quite cheap on my realm’s market. There was a leve at 25 that I used a few times as well, and as luck would have it it wanted Walnut Lumber! I milked this leve for awhile, far into the 30s, however I grew very tired of HQ’ing lumber — it’s a 40 durability recipe, and it’s very tedious. Especially when you need 15 HQ for this leve to get the most out of it. Eventually I moved on to a level 30 leve, and proceeded to make dozens of Walnut Macuahuitls*. The mats for there were easy enough to come by (Walnut Lumber) and Wyvern Obsidian — which luck has it, I was able to mine up my own HQ!. Note: If you’re going to HQ this recipe, place more weight on the Wyvern Obsidian, high quality versions contribute much more towards the quality then a HQ Walnut Lumber. While I required two Obsidians at lower levels to HQ these weapons, I was eventually able to move on to just needing 1. *Walnut Macuahuitl is mispelled in the leve text. 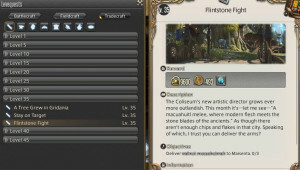 Walnut Macuahuitls are also a component of a level 35 leve that nets you about 174k exp, and 4500~ gil. That leve also happens to be the one I utilized the most, because I needed to conserve my leve allowance as I was starting to run low. However it was exceedingly boring. Luckily with the skills I picked up from GSM and Culinarian it wasn’t too difficult to HQ these weapons, however even using HQ base materials I still ran into trouble occasionally. “Flintstone Flight” 174k Exp, 4500~ Gil. This is the leve I went to 50 on. It takes dozens of crafts, and once you hit 50 you’ll be so tired of stupid Walnut and stupid Wyvern Obsidian that you never want to see it again! Get it? Ruminations?! Yeah, I know, that was weak.. 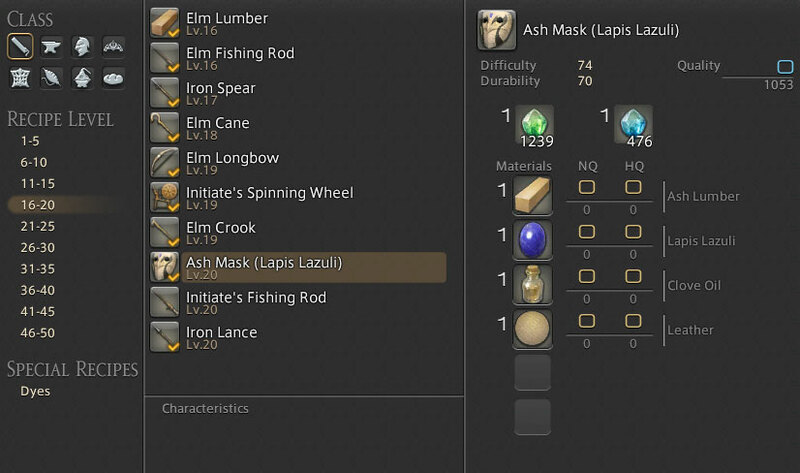 So anyway Carpentry has so far been my least enjoyable Craft to max out, mostly because of my lack of a Botanist. I figure if I had leveled one I wouldn’t have been so bored. The other issue is that near the end of my leveling I had burned through a lot of my gil, even having to dip into my reserves. I was able to make a tiny amount back on mats I didn’t use but nothing to recover the amount I spent. At 50 I was able to make myself a couple of HQ GSM secondary weapons, so that was pretty cool. Why did I suffer all the way to 50? Well Carpentry’s level 50 Cross-Crafter skill is “Byregot’s Blessing” which is amazing for HQing stuff, even 1 or 2 star items, it works in conjunction with Inner Quiet (just like Rumination does): For every “stack” of Inner Quiet, Byregot’s Blessing does 20% more quality (with a base of 100%). This means that utilizing the Hasty Touch method of quality increasing, you can get it pretty high. After 5+ quality increases, you combine Byregot’s with a Great Strides (and Innovation if you have it) and the quality just jumps forward, sometimes to max (get lucky and hit a Good status). And to be clear: Byregot’s consumes Inner Quiet, so make sure you have enough CP after using it to finish your recipe! What’s my next craft? I’m leaning towards one that uses Miner mats, so either of the Smiths. 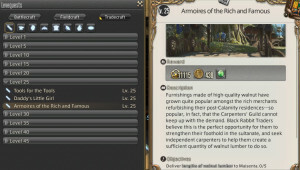 This entry was posted in FF14 A Realm Reborn and tagged carpentry, crafting, ff14 by Nick. Bookmark the permalink.